Add this vanity to your bathroom for more false style in your home. This simple vanity set from GLACIER BAY will fit right into any bathroom decor. With a modern look and strong design, this vanity will help any bathroom look nicer. Its beautiful white ceramic counter and brown particle board base bring a great new look into your bathroom. Keep your bathroom clean with the vanity's roomy double-door cabinet. Redo the style of your bathroom with this classic from GLACIER BAY. The Ashland II 36 in. 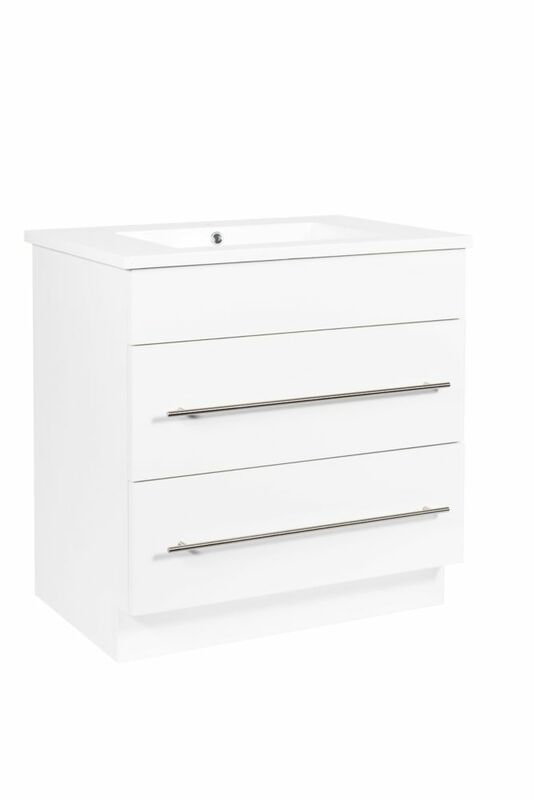 2 piece Vanity in White features 3 hidden drawers that glide out smoothly on full-extension glides to give you 100% access to stored items and accessories. Constructed of solid wood and laminated engineered wood, the sturdy, stylish vanity cabinet is treated with a crisp, clean white finish and features furniture-style door and drawer designs that create a traditional appearance. Classic and clean, the Eldan Collection vanity is sure to become the focal point of any bathroom. With the ability to enhance any bathroom, this vanity offers style and functionality with two fully extendable drawers, three convenient interior adjustable shelves and ample cabinet space behind sophisticated shaker style doors. The graceful styling combined with the added elegance of a white engineered stone vanity top with two rectangular undermount sinks makes this bath furniture collection a perfect choice. Finished in dark espresso with antique bronze hardware, this Eldan Collection vanity blends modern elements with traditional influences to perfectly complement any bathroom. The Lancaster 24.30-inch (60.9 cm) vanity with alpine white composite countertop coating has a pre-drilled rectangular integrated bowl to fit a 4" (10.1 cm) centre distance faucet (sold separately). The large wardrobe and side drawers provide ample storage space for your everyday bathroom items. The cabinet also features adjustable hinges, brushed nickel hardware and a decorative kick. Nipissing 31.10-inch W Vanity in White Add this vanity to your bathroom for more false style in your home. This simple vanity set from GLACIER BAY will fit right into any bathroom decor. Nipissing 31.10-inch W Vanity in White is rated 4.2 out of 5 by 6. Rated 1 out of 5 by Dave from Very poor quality This unit was very poorly assembled. In several places where 3 screws should have been used only one was used. The wood components are out of line where they are fixed to the metal pieces such as brackets. The top drawer is not braced and as a consequence it does not close flush. Garbage!! Rated 5 out of 5 by CJ B from Beautiful for Small Space Lots of storage! Great look! Had it professionally installed, and the drawers did cause complications due to the plumbing placement. It's so classy looking for the price. Love the soft close feature too! Rated 5 out of 5 by Genvj from Looks fabulous This vanity looks great and has oodles of storage space. Rated 5 out of 5 by saramcc123 from Love the look I bought this vanity when it was on sale, and love the look in my bathroom. I had professional plumbers do the install because the pipes came from the left side of the wall (the vanity is built for pipes coming through the back)... they had to make a new hole through the side in order for it to work in my bathroom with existing plumbing. It took them about 4-5 hours to do the install, but it was worth every penny. Love the look and the soft close drawers. Great quality. Rated 4 out of 5 by Shawkins from Love the huge drawers I had already purchased a vanity from the company that was making my kitchen cabinets but they didn't have anything with drawers. When I saw this, I knew it was what I had been looking for! The draws have so much space. My only complaint is that the sink doesn't have enough angle to it to drain well, making it harder to clean. I end up having to dry it out with a towel. Looks great and soft close drawers are fantastic.